More than 80 years after his creation, Mickey Mouse continues to surprise. 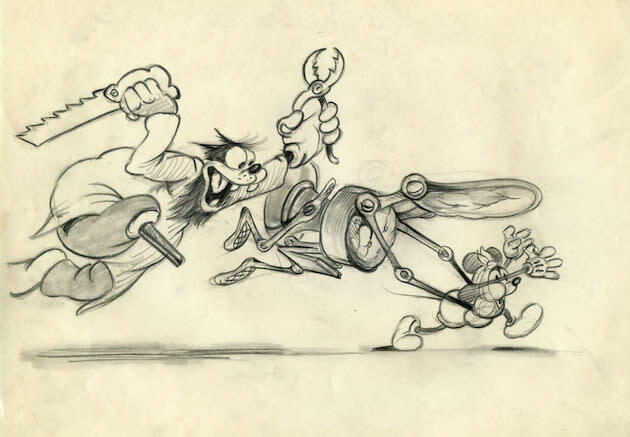 The Disney archives have released a newly discovered sketch from 1938, “Mickey’s Toothache,” part of an incomplete cartoon that was part of an effort to make Mickey a more complete character. In “Mickey’s Toothache,” created in April 1938, artist Ferdinand Horvath has the newly adventurous Mickey experiencing something akin to a psychedelic nightmare. In the words of Disney Archives Director Becky Cline, Mickey has traveled to the dentist and fallen under the influence of too much laughing gas. The overdose sends Mickey into a “nightmarish world inhabited by living teeth, dental floss, a psychotic dentist’s chair and a vengeful pair of dental pliers," said Cline. Mickey’s then-nemesis Pete also makes an appearance in the nightmare scenario. It culminates with Mickey being put on trial led, of course, by a judgmental wisdom tooth, who charges Mickey with tooth neglect. The previously forgotten piece of artwork was discovered in the Walt Disney Archives, hiding out in a folder lost for more than 74 years. It was unearthed just a few months ago. “Mickey’s Toothache” is just one of several unveilings being planned as part of this year’s D23 Disney Fanniversary Celebration, an event that began last year as a way to include members of Disney’s official fan club in some of the company’s milestone events. The Horvath image will be included in a 90-minute presentation showcasing some of this year’s other major Disney anniversaries in 10 different U.S. cities (Boston, Chicago, Los Angeles, Newark, Orlando, Phoenix, San Diego, San Francisco, Seattle and Washington, D.C.). “Mickey was kind of growing and stretching. He left the barnyard, and he started to become more adventurous,” Cline said. Though most people think of Walt Disney himself in relation to his most-famous individual creation, Horvath was a significant part of the early Disney years. Born in 1891 Horvath spent time in a Russian concentration camp where he taught himself to draw before immigrating to America on Armistice Day 1921. He worked for the studio from 1934 through 1944, producing between 70 and 80 animated shorts along the way and working on the production of "Snow White." Last year, we brought you the story of a newly discovered, 85-year-old Oswald the Rabbit sketch, “Harem Scarem.” Since then, Disney has pushed forward with efforts to bring Oswald, a Mickey prototype of sorts, back into the Disney fold. So, will we ever see a complete version of “Mickey’s Toothache”?